"The fundamental principles of free trade should be upheld," Premier Li Keqiang said. From artificial intelligence and invisibility cloaks to the future of jobs and Jack Ma's tips for entrepreneurs, here's a look at some of the key moments from our tech-focused meeting in China. The basic principles of free trade should be maintained and unilateral trade actions will not solve any problems, Chinese Premier Li Keqiang said in his speech, the headline event on day two of the meeting. The premier added that maintaining a rate of steady growth in the world's second-largest economy is getting more difficult, that intellectual property breaches and other business malpractice would be swiftly punished, and that the country would not engage in competitive currency devaluation to weaken the yuan to boost exports. "The fundamental principles of free trade should be upheld ... Taking a unilateralist approach will not solve any problems," said the premier. Despite economic uncertainty created by the trade tensions between China and the United States, Jack Ma said he sees no reason for young companies to despair. In a speech that covered everything from tariff disputes to honey badgers, the Alibaba founder and executive chairman had some bold tips to share with entrepreneurs. Meet new people and learn from them, was one. Drawing on his own experiences, Ma said: "For me, living here on this planet is an opportunity for me to know people of all varieties: good people, bad people, great people. And that is my nutrition. "For my university and for entrepreneurs, the reason we are there is because we need to know about other people. But more importantly, we need to know about ourselves. We need to know how imperative it is to learn from the great people." 3. What will the robot revolution do to our jobs? The future of work was something of a hot topic in Tianjin; a host of sessions zeroed in on the issue and many of the contributors to our AMNC18 blogs collection were keen to share their views on what the robot revolution means for skills and education. 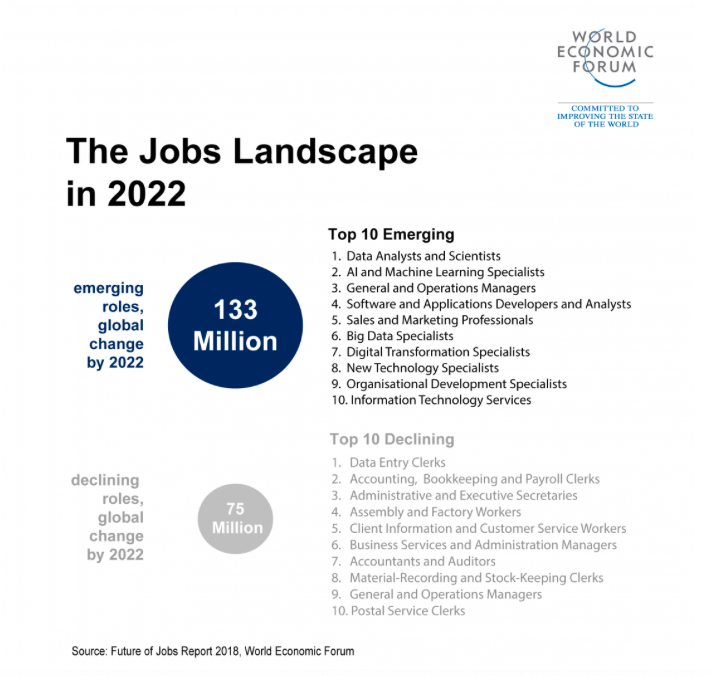 The Forum launched the latest edition of its Future of Jobs Report just before the meeting kicked off, looking at the trends expected in the 2018-2022 period in 20 economies and 12 industries. One of the key findings? Machines and algorithms take on more tasks than humans by 2025 - and here's a closer look at what else it had to say. Meanwhile, the Forum's Saadia Zahidi shared this advice on how workers can win in the age of robots. Out in the live sessions, Hilary Cottam, Founding Director of Participle, said: "The transition is going to be bloody at best... We need to reinvent new forms of support. Social and labour institutions needs to change radically." There's one sure way to mitigate the cost of this doomsday scenario, said John Hawksworth, Chief Economist at PwC - invest in lifelong learning. "Instead of doing three years of university when you're 18, you might do one year when you're in your teens and another in your thirties, another in your fifties." Before the meeting had even started, news filtered through that the US was slapping tariffs on a further $200 billion worth of Chinese goods. The Chinese government reacted swiftly with tariffs of their own. It's no surprise that trade was a popular topic of conversation at this year's AMNC. Very, said Timothy P. Stratford, Managing Partner at Covington & Burling. "We've come to the point now where both governments have realized that the real issues have to do with deep systemic differences between the economic systems of the two countries," he said. "We are going to be in for a long period of deadlock," he added. "It's a really worrying situation and it's starting to spill over into other parts of our interconnected world," said Wendy Cutler, Vice-president of the Asia Society Policy Institute. Cutler also said the World Trade Organization (WTO) rules that govern global trade are in dire need of an update. "The last time the rules were really updated ... was over 25 years ago," she said. "The internet was barely around then ... China wasn't even part of the WTO. And so as a result, we see the WTO today really becoming increasingly on the sidelines of what is going on. And frankly if it does not deal with the need to really update the rules and figure out a way to become relevant, it may even slip into the background more. And that is dangerous." What do lab-grown meat, a holographic museum guide and a supercharged version of Amazon’s Alexa have in common? They’re all breakthrough technologies that are likely to shape our lives in the near future, according to a list published by the World Economic Forum just as our meeting in Tianjin got underway. Selected by a panel of scientists and experts, each one has been identified as having the potential to be disruptive by altering deep-rooted practices or shaking up whole industries. While we’ve all heard how technologies like artificial intelligence and quantum computing are set to transform our everyday lives, the coming change can seem like a nebulous concept that’s hard to define. In this list, experts seek to pinpoint the breakthroughs that will take effect within three to five years. Wealth inequality is one of the most well-documented problems facing the global economy. What's less well-known is that it's also a major challenge in the relatively nascent cryptocurrency industry. "This economic premise of fairness and equality has not yet been realized," says CoinShares' Chief Strategy Officer, Meltem Demirors. "It is very problematic ... Twenty-percent of bitcoin are owned by the top 100 wallets. Ethereum is even worse, in Ripple it's something like 70%. So not very decentralized. "I've always said if a venture investor owns 50% of the tokens in the new internet, as a consumer, I don't want to use that internet. So for me until we sort that problem it will be very difficult to build globally useable networks." In a session on the future of electric vehicles, an industry that is rapidly becoming dominated by Chinese innovation (almost half of all electric cars are manufactured in China), three of the panelists noted that they were held up that morning because - ironically - traffic was so bad in Tianjin. But could gridlock like this become a thing of the past? Yes, said Dipender Saluja from Capricorn Investment Group. Electric aviation is upon us, he said, and vehicles that take off and land vertically are "just around the corner." These could transform high-congestion areas and turn one-and-a-half hour morning commutes into a five-minute journey. - A total of 14 Chinese AI companies are unicorns, or private start-up companies valued at US$1 billion or more. - Only two of the 50 companies had female founders. - 27 of the 50 companies are backed by Chinese government related funds and/or the BAT. BAT refers to Chinese technology giants Baidu, Alibaba and Tencent. - 55.6% of the founders have doctoral or post-doctoral degrees. Over 73% have at least a master’s degree. - China AI Top 50 companies are more mature than their peers. Around 80% of the 50 companies have completed series B or later investment rounds. The industry as a whole sees 81% of the companies having just completed series A rounds. - The most active investors in the China AI Top 50 include Sequoia Capital China; Alibaba and its related entities and funds; Zhen Fund; Sinovation Ventures; and Tencent. In the future you won’t need your keys or your wallet. Your ID card and passport will be a distant memory. All thanks to advances in voice, facial and DNA-recognition technology - and other developments in the field of biometrics. Rob Livingston, Senior Vice-President at Visa, described some prototypes that could change the way we pay in the future. These included "blood flow" based technologies, where you would swipe your wrist to be identified; rings that would use near-field communication; and plastic cards with in-built fingerprint recognition. Participants also discussed the dark side of biometrics, from privacy to security. "Is it safe? No. Facial recognition systems can be hacked," said Rita Singh, Associate Research Professor at Carnegie Mellon University. She also warned that voice recognition posed all sorts of ethical problems, since algorithms can now deduce intimate information including your personality type from your voice. AMNC18 also gave us the perfect opportunity to launch the Centre for the Fourth Industrial Revolution China. With artificial intelligence, autonomous mobility, the Internet of Things and other emerging technologies having such a disruptive impact on almost every aspect of our daily lives, the center will bring together Chinese leaders at the highest level from government, business and other sectors address some of the challenges that this will raise.